About "Sandwich, With a Side of Romance"
Krista Phillips is a debut author and owner of the popular blog, One Woman s Dream (http: //reflectionsbykrista.blogspot.com/). She lives with her husband and four daughters in Middle Tennessee. 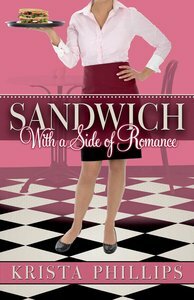 Customer Reviews For "Sandwich, With a Side of Romance"
This made for a great summer read. Humorous characters who find themselves in rather funny circumstances. Maddie made me laugh, although I would have though she would have been too desperate to be so snarky with her boss! Reuben's sometime girlfriend seemed a bit too nasty for him ever to have found her attractive. However, it was a good light Christian chick lit book - no deep teaching here, but fun. Madison Buckner has moved to Sandwich, Illinois, to start a new life and to try and get custody of Kyle, her eleven-year-old brother. She is fired from her job as a hairdresser on her first day, and talks her way into a new job as administrative assistant to Reuben Callahan, the overworked owner of The Sandwich Emporium. This is a fast, enjoyable read, with a freethinking and likable heroine and a slightly-uptight hero who is almost engaged to his on-off girlfriend of almost ten years, and is now trying to fight his attraction to his new assistant. If there was one thing that was not quite up to standard, it was the character of Livy - she filled too many 'other woman' clichs. But this was more than compensated for by the positives, particularly the way Maddie comes to terms with her past during the course of the novel. Overall, Sandwich, With a Side of Romance is a perfect beach or holiday read, with a healthy combination of fun and serious. Thanks to Abingdon and NetGalley for providing a free ebook for review.